Bill's got those good vibrations: Bill Laimbeer loved basketball, but he loved to dance even more. When Marky Mark and the Funky Bunch burst upon the scene in the early 1990s, Laimbeer knew he had a new group to emulate and interpret off the court and on. Though many teammates and fans enjoyed Laimbeer's mid-game dance shows, opponents such as Patrick Ewing, above, often physically showed their contempt for his theatrics. 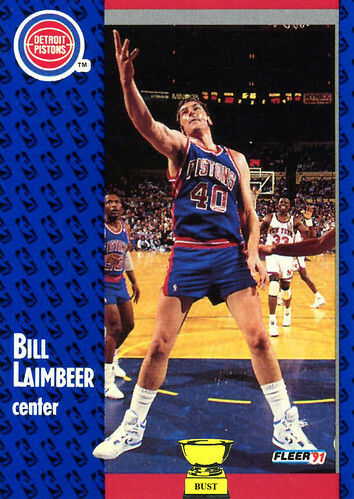 Laimbeer's "Good Vibrations": "Yeah. Can you feel it, Ewing? I can feel it. Come on swing it. One, two, three. Now we come to the playoffs. (chorus) It's such a good vibration. It's such a sweet De-troit Piston. It's such a good vibration. It's such a sweet De-troit Piston. (end chorus) Yo. It's about that time, to bring forth the rebound and the rhyme. I'm a get mine, so you get yours. I want to see that sweat, Ewing, coming out yo' pores. On the house tip is how I'm swishing this. Strictly hip-hop, boy, I'm not missing this. Bringing this to the entire nation: Knick, Celtic, Pacer, Laker. Feel the vibration. Come on. Come on. Feel it, Ewing. Feel it."